Dr. Chinnaiyan’s laboratory is focused on using functional genomic, proteomic, metabolomic and bioinformatics approaches to dissect and understand cancer biology as well as discover biomarkers. He and his collaborators have characterized a number of biomarkers of prostate cancer including AMACR, EZH2, hespin and sarcosine. His laboratory identified recurrent gene fusions of TMPRSS2 to ETS family transcription factors in prostate cancer, potentially redefining the molecular basis of prostate cancer as well as other common epithelial cancers. His laboratory developed the popular cancer profiling bioinformatics resource called Oncomine (www.oncomine.org). 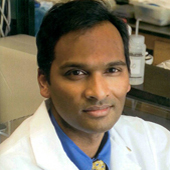 Dr. Chinnaiyan has received a number of prestigious awards including the Dean’s Basic Science Research Award, the Amgen Outstanding Investigator Award, the Pew Biomedical Scholar Award, the Burroughs Wellcome Fund Award in Clinical Translational Research, the 2006 Benjamin Castleman Award, the 2007 Ramzi Cotran Young Investigator Award and was appointed as an Investigator of the Howard Hughes Medical Institute. Dr. Chinnaiyan was also elected as a member of the American Society of Clinical Investigation and the Association of American Physicians.